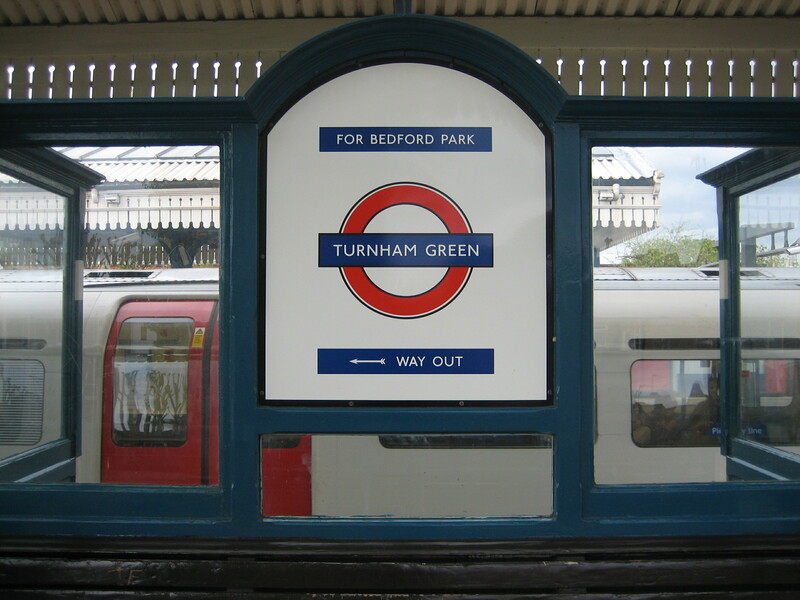 These aren’t unique to Turnham Green, but seem to be in much better condition here than elsewhere along the District line. 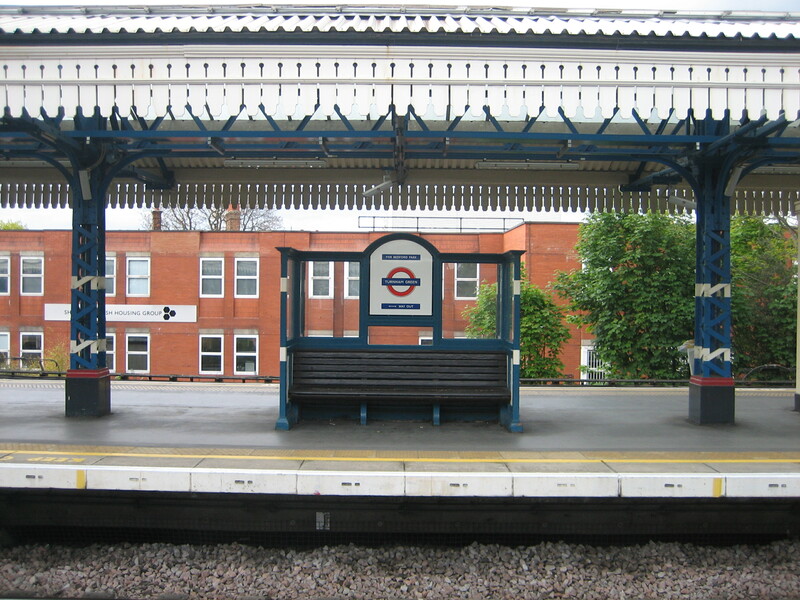 Should you be at all taken by the shape and the sheen of a good bench, moreover one that incorporates both a crisp slab of signage and half a dozen windows to boot, then the station least beloved by seasick sailors* is the place to be. There’s a quiet, gentle beauty to such atypically multi-purpose public transport furniture. Two things are going on here. One is an appreciation of form, and the other is an attention to detail. Each complements the other, and from their marriage emerges the sort of place I’d be happy to sit for half an hour or so, cocooned from other people and the elements, with only my thoughts and a good (but not great) book for company. Attention has also been paid to how they look as part of the station as a whole. The colours in turn mirror those on the roof itself, which is a rather fine piece of architecture in its own right thanks to that intricate threading of wood and metal. Either tucked up inside or facing them from an adjacent platform, you can’t help but feel these benches have benefited from having that extra bit of thought, even love, put into their construction. And that feeling is what encourages you again and again to conclude that the Underground is a thing of greatness. For where else is the same care lavished upon somewhere to rest your legs as somewhere to carry millions of people under a giant river four times or 18 metres over a valley? *An oldie, but a goldie. Speaking of benches on the Underground, for several years now I’ve been intrigued by the ancient-looking small wooden bench that sits on the landing near the top of the stairs at Borough (at the top of the spiral steps just before the final two flights leading to the ticket hall). What on earth is it there for? Perhaps for surface-headed travellers to take a little rest before tackling the final 20 or so steps to the surface? I’ve often thought it would be most amusing to come across someone having a sit down there (perhaps a couple having a picnic while waiting for some pigeons to turn up to feed) – but sadly this has not happened yet. PS: Great website; very enjoyable.